A groundbreaking ceremony for the cooperative residential complex for the employees of ANAS was held today in "Science City" in Saray settlement of Absheron district. Academician Akif Alizadeh, president of ANAS, said that the academy has been implementing complex measures to improve the social conditions of its employees. He stressed that the first housing complex to be built in the history of the Academy is one of the most successful projects. The work on the solution of social problems of employees will always be in the focus of attention of the management, he added. Akif Alizadeh noted the successful implementation of the state policy in the country in recent years with the initiative and leadership of President Ilham Aliyev. He underlined that large-scale and consistent measures are being implemented to improve the social welfare of the population and improve the living conditions. Then head of Absheron District Executive Power Irada Gulmammadova said the construction of a new complex is of great historic significance for Absheron residents. I.Gulmammadova noted that "Science City" residential complex is located in the area of ecologically clean air. He noted that the establishment of the relevant social infrastructure, as well as non-residential areas for public catering, household, school, kindergarten and other service facilities are also planned to be put into operation. The Deputy Minister of Education, Firudin Gurbanov, praised the foundation of the science city as an important historical event. 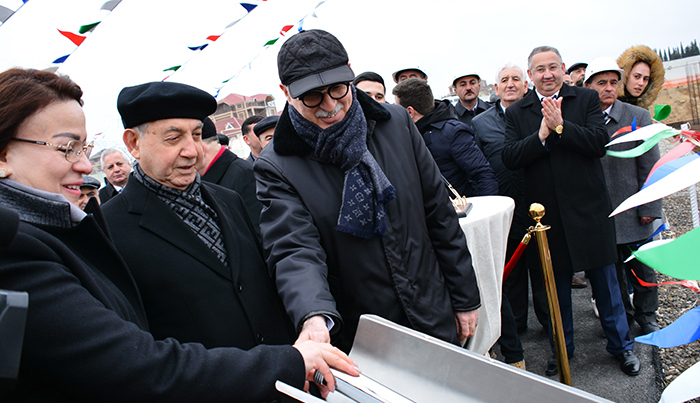 Academician Akif Alizadeh, after cutting the ribbon, laid the foundation of the first building to be built at Science City residential complex. It should be noted that the construction of large parks in the yard of "Science City" residential complex, designed to improve the living conditions of employees of ANAS, is planned to be built in modern design and high quality, with 1, 2 and 3 rooms.